GMG was seeing 'green' and lots of it at the 2007 Philadelphia Flower Show where the theme this year was 'Legends of Ireland.' The Philadelphia Flower Show is the oldest flower show in the United States and the largest indoor flower show in the world, attracting more than 250,000 visitors annually from across the country and the world. Visitors found inspiration for their own gardens in the 10 acres of breathtaking gardens, floral exhibits and entertainment celebrating the emerald isle. 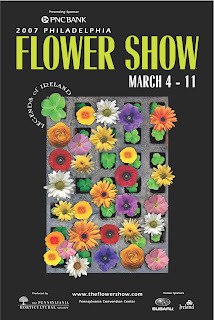 Each exhibit brought yet another piece of Ireland's beautiful lush countryside to our own backyard while also providing great gardening tips and ideas for the gardener in us all. All show proceeds support The Pennsylvania Horticultural Society, including its acclaimed urban greening program, Philadelphia Green. Photo Provided by The Pennsylvania Horticultural Society.